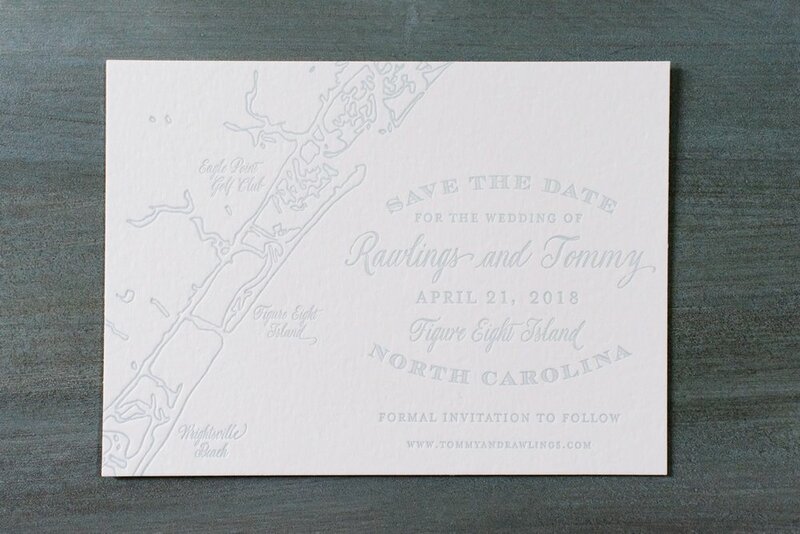 It’s been almost a year since Rawlings and Tommy tied the knot on Figure Eight Island. 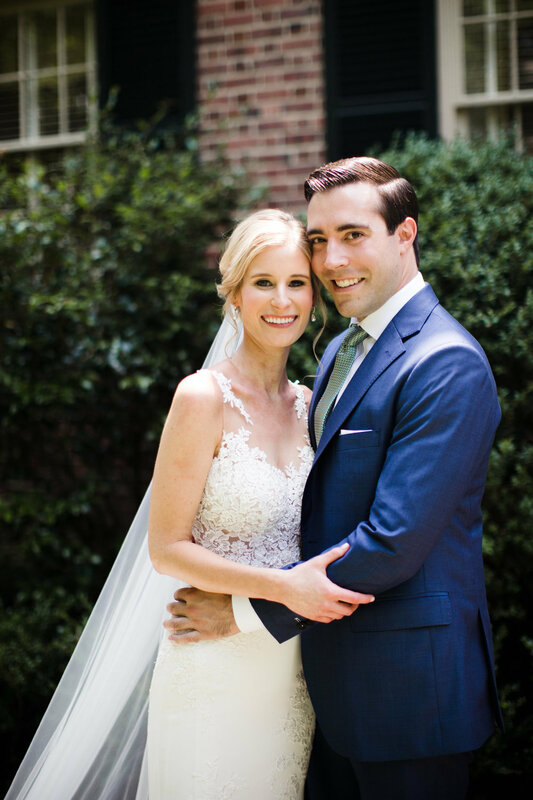 Carolina blue skies hung overhead and full hearts celebrated the happy couple. 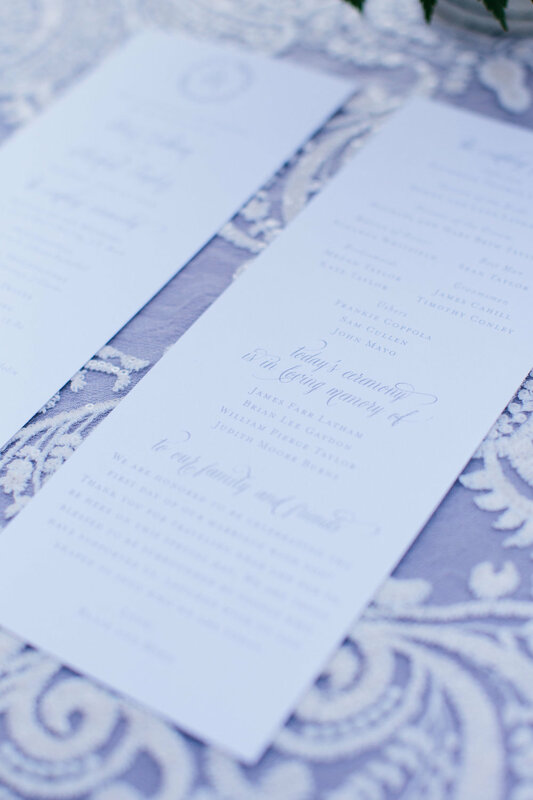 Rawlings’ paper trousseau used a beautiful shade of blue to echo the coastal backdrop. 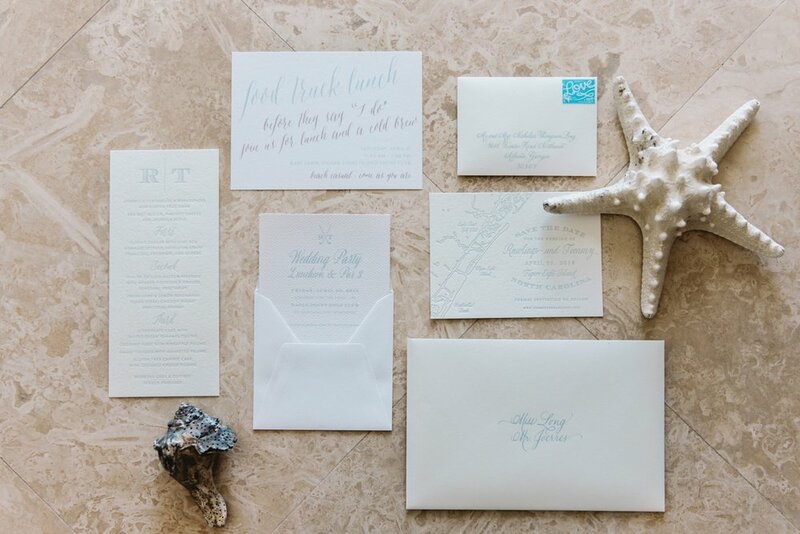 From the Save the Dates to the menus, a cohesive looks was created that tied all elements of the wedding weekend together. No detail was left undone. We just love how all of the paper pretties enhanced the festivities. Read on to see all the details. Jenna discovered us after she had already ordered her wedding invitations. She was hoping to have someone local guide her through the final details of the wedding. 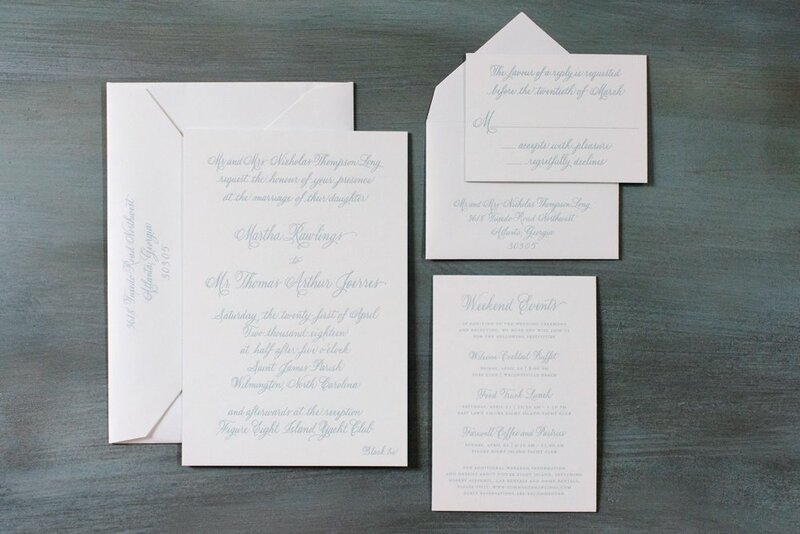 We were able to take the tone of the invitations, and incorporate her vision for the wedding to create her day-of pieces. 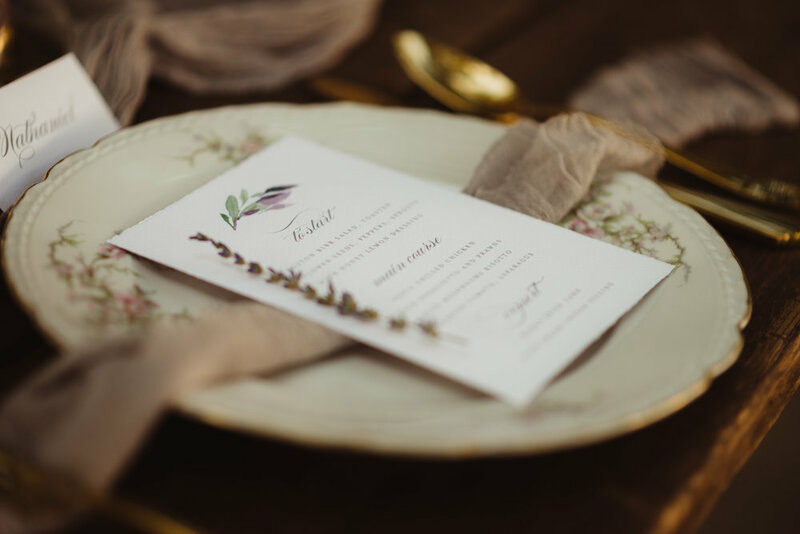 From the place cards tucked into the hand-tied napkins, to the candlelit table for two reserved for the bride and groom, this wedding was all about the details. Cool grey tones were sprinkled throughout the evening and played beautifully against the gold details. 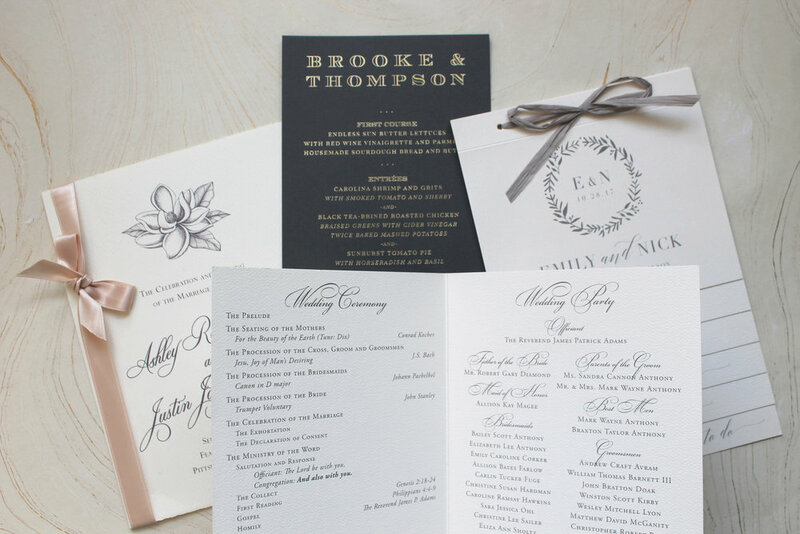 For the programs, we incorporated the grey and white floral motif from the invitation envelope liner. 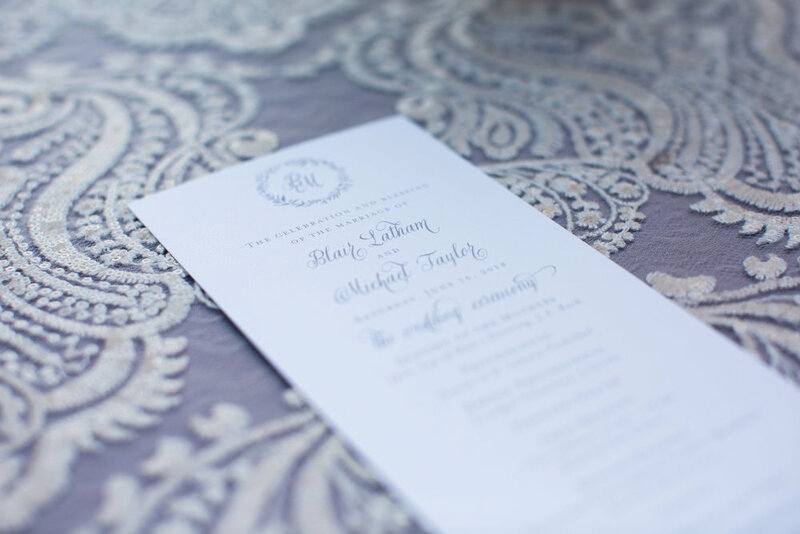 Carrying the same fonts and colors from the programs to the menus helped create a cohesive look between the ceremony and reception. These pieces matched others signage used at the wedding. You can’t help but feel the love as shown through all of the little details at the wedding. We can help you finalize the details of your wedding, no matter where in the process we meet! 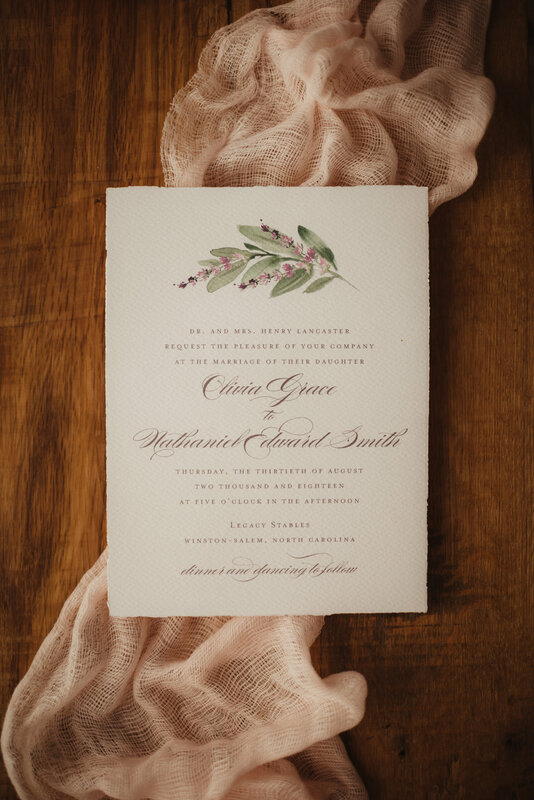 We are so excited to have been featured on Bustld this week with these dreamy lavender invitations. 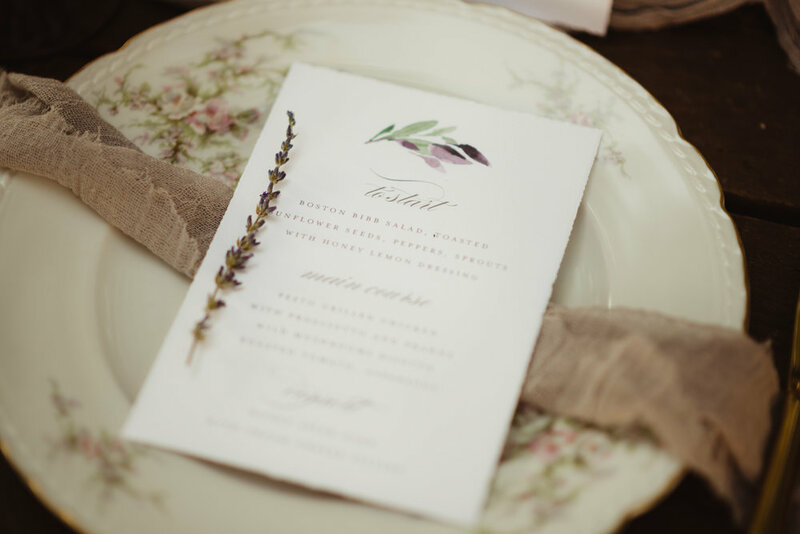 Take a look at the pieces we created for this styled shoot, and check out their post here. Ok, I admit it. I can recite the Father of the Bride movie almost word for word. Steve Martin as George Banks and his perfect one-liners. “You know, that's not a bad idea. Who else can we ask not to eat? While there are many factors that go into selecting the menu, by the time the wedding day rolls around, your guests aren’t privy to all the back and forth. Do we go with the filet or the cheaper chicken? They just get to enjoy a wonderful meal. Having a menu at the wedding allows your guests to know what type of food is being served and allows the chef to showcase the hand-picked ingredients. It is especially helpful if you have many out of town guests who may not have eaten traditional local fare. If your guests have a choice of entrees at the wedding, the menu will explain the options. If your caterers need the selection prior to the big day, you can ask your guests to pre-select an entree. Typically this option is given on the RSVP card, and guests are asked to initial a choice for each guest. You can be specific with the description, or more generic. I love the use of small icons. When designing the menu, tie in colors or use a motif that was carried from the programs or napkins. Be sure to think about the table linens and place setting. 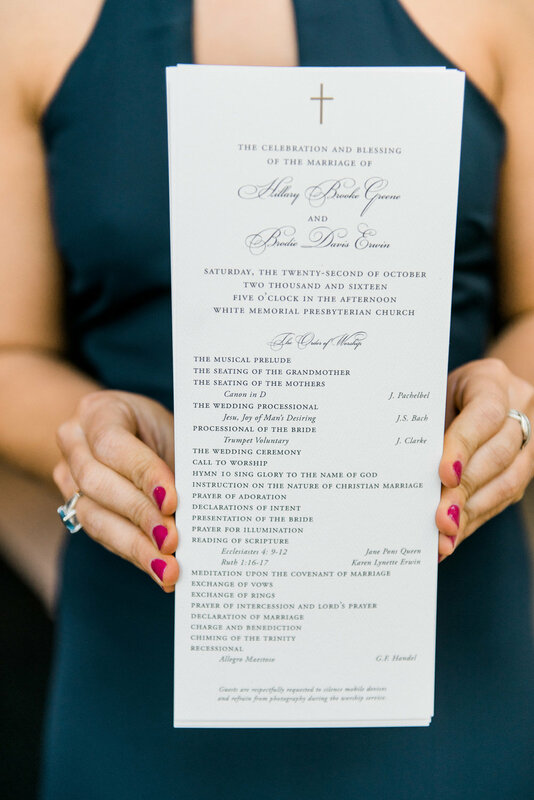 You will want the menus to complement everything since they will be front and center on the platesYou could say that watching and re-watching Father of the Bride in college did give me job preparation! I love all of the details, and helping our brides pull everything together. 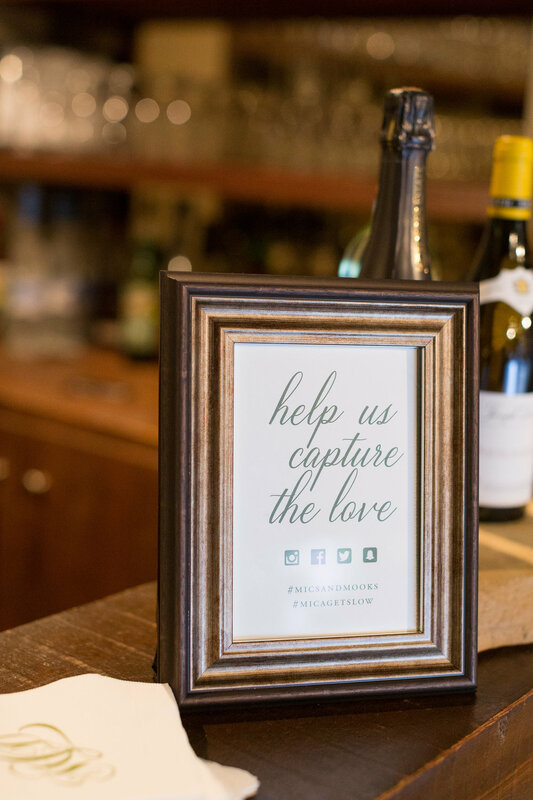 Because after all, it’s the little details that add up making your wedding unforgettable. We just loved being a part of Blair and Mike’s classic, southern wedding. The Barn at Chapel Hill was the perfect backdrop to showcase their love for one another, and the thought they put into every detail. Originally from Burlington, North Carolina, Blair now lives in Washington, DC. As a sign of the times, we worked with her remotely on almost all aspects of the wedding. Between emails, texts, and long distance phone calls, we crafted a cohesive feel for all of her day-of paper needs. The personalized paper elements coordinated with the heartfelt touches the bride included, such as framed photographs of their parents and grandparents on their wedding day. Scroll through the photos below and get a glimpse of this timeless affair. One color letterpress from our friends at Bella Figura printed on 2 ply cotton paper. Hand calligraphy by Sarah Hanna. The classic calligraphy, juxtaposed against a more modern square size, work beautifully together. Hand addressed by Calligraphy by Carole. The collection of vintage stamps on each envelope convey the timeless feel the bride incorporated into so many details. The couple debuted their custom duogram and carried it through multiple pieces. 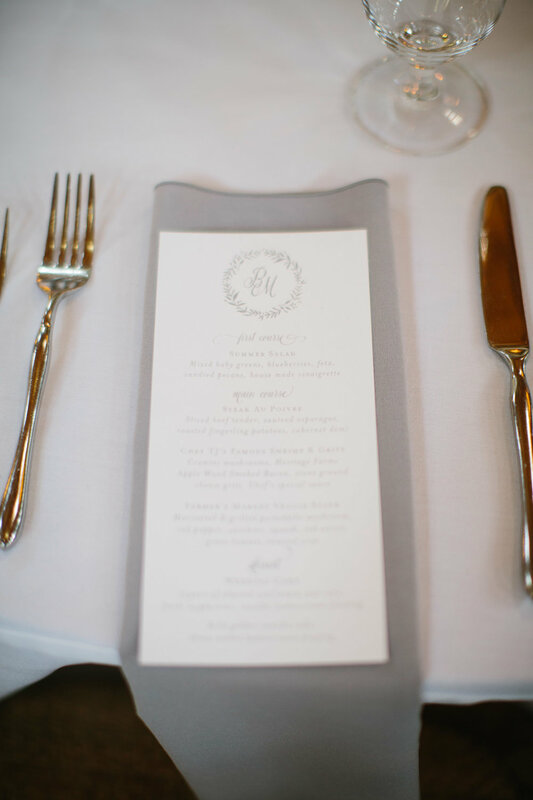 The programs, menu, and placecards were printed digitally on 100# white felt stock. Although you’re not likely to encounter lions, tigers, and bears (oh my!) when planning your wedding, sometimes all of the emerging details are just as scary! Do we want programs? 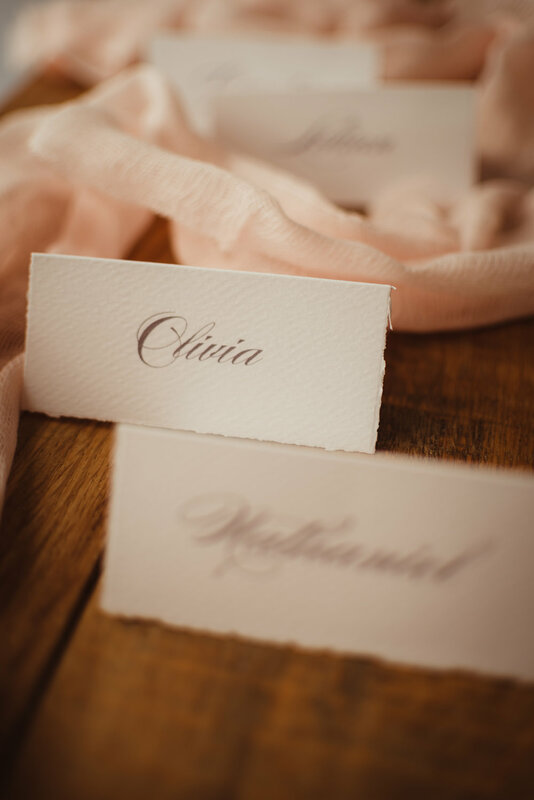 Are place cards necessary? What about weekend itineraries? Programs are often handed out at the wedding ceremony. They include information such as the order of the service, readings, song titles etc. Additionally, couples use the programs to introduce the wedding party to their guests and as an opportunity to say a special thank you, or greeting. Sometimes pertinent reception information (such as directions or transportation information) is written on the back side. Lots of options exist for program formatting: long and skinny, foldover booklet, tri-folds or even fans for those hot summer weddings! 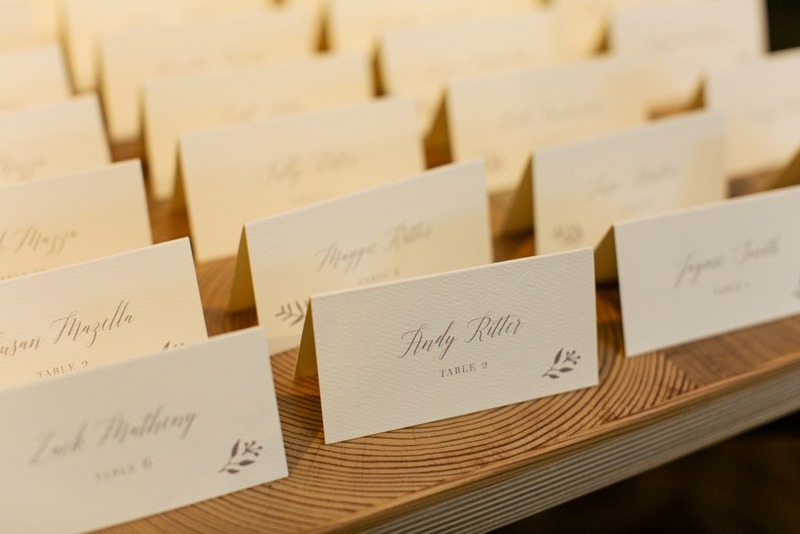 Place cards and table numbers are used for seated dinners. We have a large selection of place cards and table numbers in stock that can be personalized. 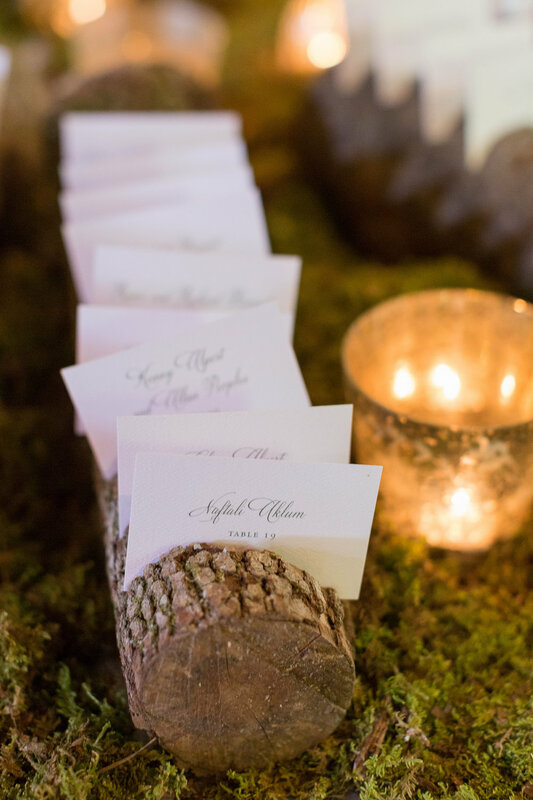 At If It’s paper, we are able to print the names of all of your guests on placecards ahead of time. 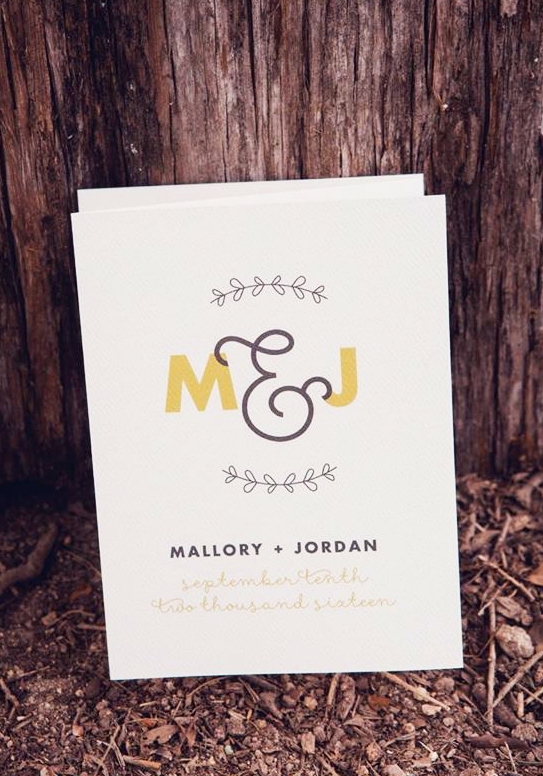 Or we can add a custom motif to a place card, and then the names can later be added by a calligrapher. Other components for the wedding weekend we have created include welcome booklets, city guides, gift tags, favor tags, signage and more! Using the same font, color, or monogram throughout your pieces gives a cohesive flow. It adds a personal touch without getting too theme-y. We typically work on programs about 3-4 weeks before the wedding. If you have all of your information nailed down, you can certainly start earlier. Often, though, the details don’t come together much sooner. If you can dream it, we can make it! And we promise it won’t be scary! We had the immense pleasure of working with a local Greensboro blogger, Emily Helm Wilkinson, on all her wedding day-of details last Fall. 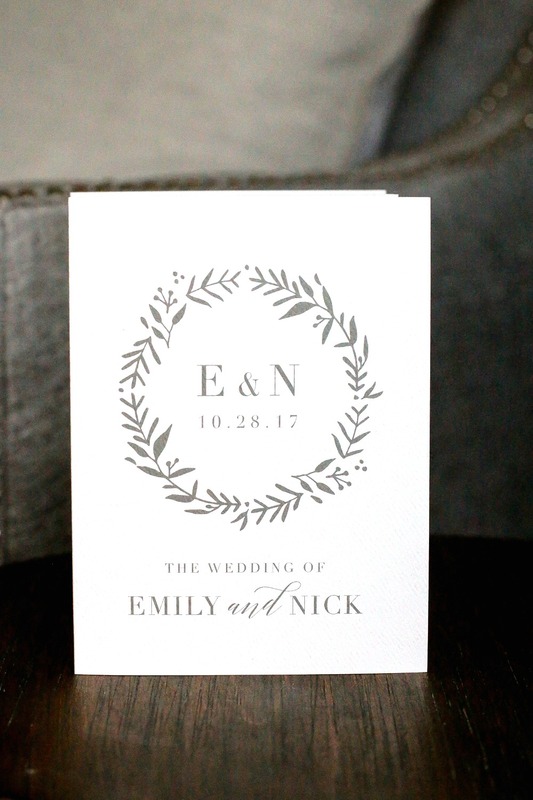 From custom welcome booklets, tags, programs, menus and place cards to printed napkins and cups, Emily & Nick's special day was filled with personal touches that made the day unforgettable. So for today's post, we are leaving the blogging up to the professional, and just giving you a glimpse of the details we created below. Head on over to Emily's blog to check out all the other goodness from her beautiful wedding. 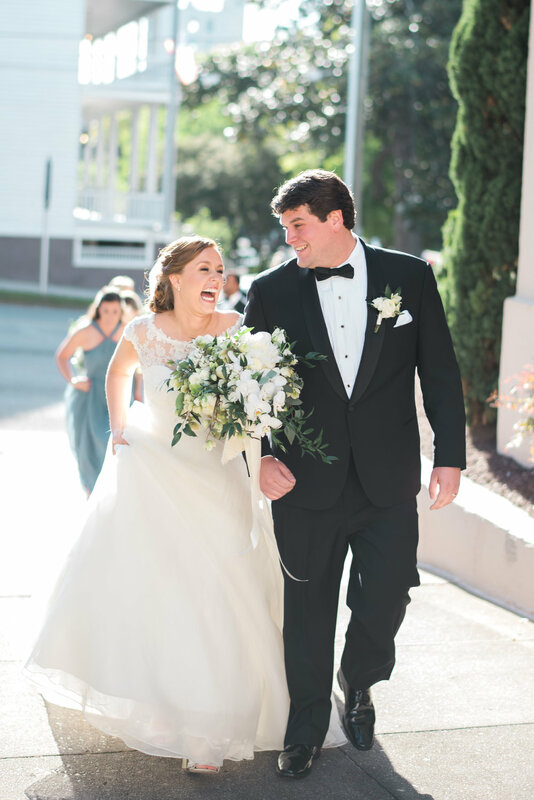 One of our favorite things is when we have the opportunity to work with a bride from start to finish, helping her turn her vision into a reality… and it’s made even better when the bride is a childhood friend! We had just this opportunity with Mica Medoff for her June 2017 wedding. Mica, originally from Greensboro, now lives in New York City. 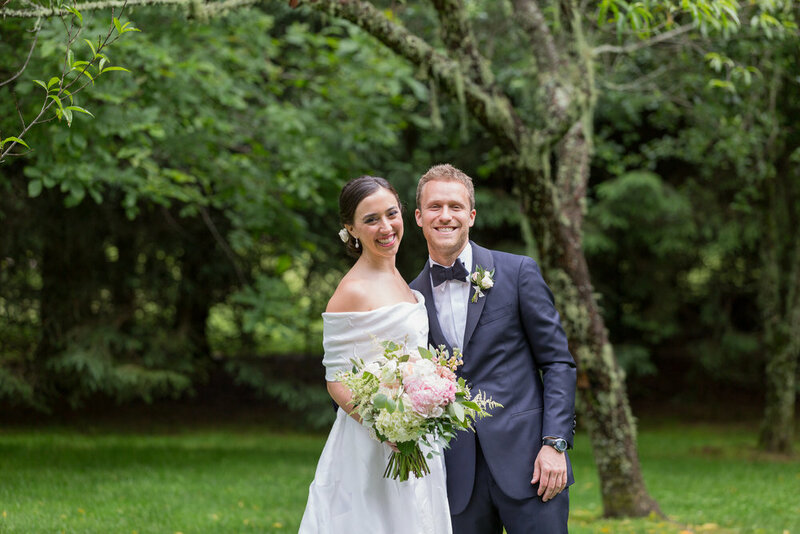 The summer wedding affair took place in the mountains of North Carolina, and we were honored to be a part of her entire wedding journey. These beauties were printed by our partners at Bella Figura. 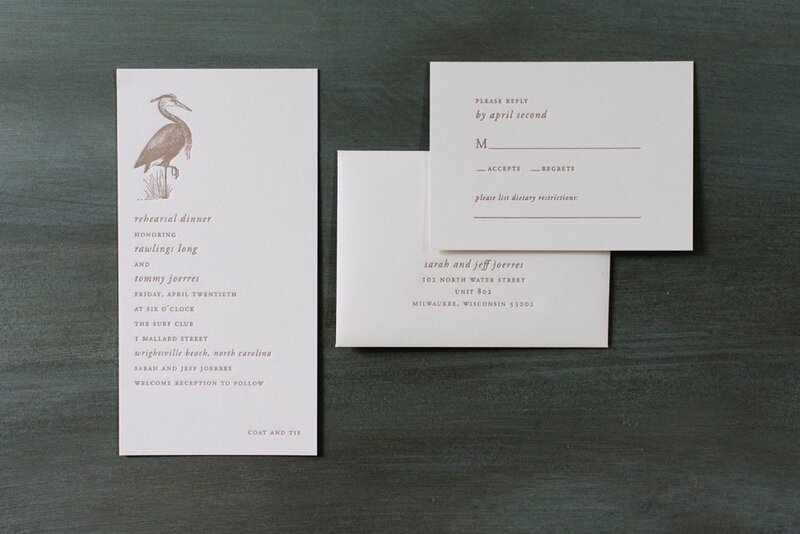 Mica used vine green letterpress on two-ply cotton paper featuring custom calligraphy from Sarah Hanna and floral lined envelopes. Her suite included a weekend events card and a response set, and once we held it in our hands, it's hand-crafted charm made it hard to put down. A digitally printed folded program featuring a beautiful custom duogram by Sarah Hanna. These simple, yet oh-so-elegant cocktail napkins featured the couple's new married monogram in a moss green matte foil. We were honored to be a part of Mica and Daniel's picturesque NC wedding. All the best wishes to this happy couple! Sign up to receive the latest news and specials from us every other week!